Wandering around the grocery store the other day, I just couldn’t decide what I was hungry for. The Swiss chard looked so stunning– in the cart it went. But what to serve with it as I meandered past the meat counter…. My preference is to cook skirt steak on the barbecue, but I do have a cast iron skillet for the lonely Chicago winter months. It’s a decent backup. The skirt takes nicely to the ginger and horseradish marinade and cooks in minutes. And the little charred pieces of ginger and horseradish are like little croutons on top of the meat. Yum! The whole meal was ready in less than 15 minutes (not including marinading time). It’s real food and real flavors coming through without being overdone. It’s healthy, it’s quick and tastes super. What’s not Fat and Happy about that? Make the marinade for the skirt steak first. Chop the garlic, ginger and horseradish and place in a Ziplock bag with the steak and the olive oil. Set in the fridge for at least 2 hours but up to 1 day before using. 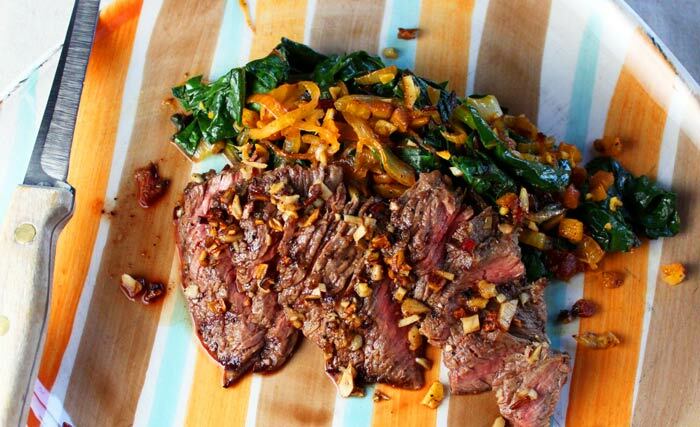 Take the steak out of the fridge at least 30 minutes prior to cooking to allow to come to room temperature. Heat a grill to medium high (I used a cast iron pan on my stove top), cook the skirt steak for just about 3-4 minutes per side (timing will depend on how thick your steak is). You don’t want to overcook this. Remove the steak, cover with tin foil and let rest 10 minutes before cutting to help retain the juices. Slice thinly and enjoy. Rinse the Swiss chard and beet greens, set aside. Cut the stem of the Swiss chard from the leaves and dice up. Cut the leaves into 2″ slices. Slice the onion and dice the beet (peel the beet first). Add to a large saute pan with the chopped Swiss chard stems and olive oil and cook over medium heat until the beets and onion begin to soften (about 10 minutes). Add in the garlic, Swiss chard and beet greens, and then toss. Add another drizzle of olive oil if the pan is getting too dry. Continue to cook for another few minutes to wilt the greens. Season with salt and pepper, and enjoy. Tips and technique: I added some leftover beet greens in with the Swiss chard. Can’t beat extra nutrients!